After a couple of weeks off the cigars I had two smokes I had not had before at the weekend. The first was a fairly recent release of Rafael Gonzalez Coranas Extra which is a Corona Gorda in size (46×143). The look of the stick was very much classic Rafael Gonzalez with a darkish wrapper that never look too oily or rich. The condition and storage had been good and on first lighting it was straight into a nice place, elegant balance is what I look for in RG’s. They are never heavy and this got to medium towards the backend but never any more than that and was a perfect mid-afternoon smoke. The size is one that I love, in honesty I’m not a massive fan of going over the 46 gauge. The stick was a fair bit box-pressed, squared-off by being tightly packed in the box, but not to a degree than was irritating though I would always prefer cigars not to be. The dominant flavours were of light milky coffee and tanned tobacco, little or no sweetness and not a cigar that, despite being lighter in weight, I would give to newer smoker. I think this stick was totally ready to smoke, no harshness, but at the same time I think it will be more and more elegant in the medium term. I missed out on buying some of these recently and am regretting it. This specific cigar has been discontinued for some totally ridiculous reason. The second smoke was both a different size and a different age. 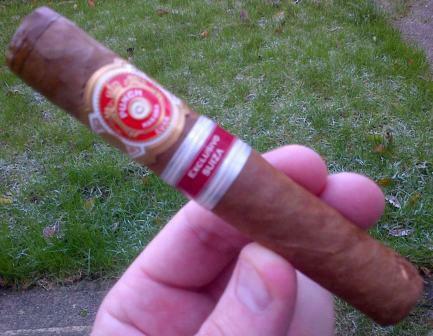 It was a Punch Robusto from 2007 that was a designated Swiss Regional Release. Punch does not have a Robusto in its range ordinarily and is not a brand I am that experienced with. This had a lovely white ash that you tend to get more often with tobacco that has more age. The burn was good and surprisingly slow. It was not a remarkable cigar but a good one nevertheless. It reminded me a little of a good Hoyo de Monterrey Epicure No2, it had elements of hay, straw and dry tea. I love trying these new releases, I only wish more and more of them were in the more elegant ring gauges 36-42 but this is no new view. 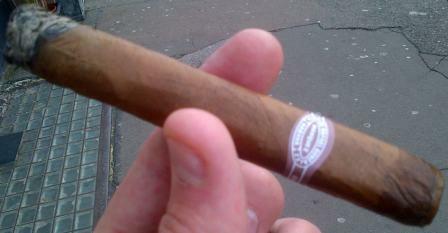 Buy the “thinnies” while you can as “wide is beautiful” seems to be the Habanos SA mantra. It is good to be back smoking after what felt like a boring virus! Previous Previous post: Birthday bottles….